Sophomore MyNeshia McKenzie looks to lead the Broncs to a successful season in 2011-12. 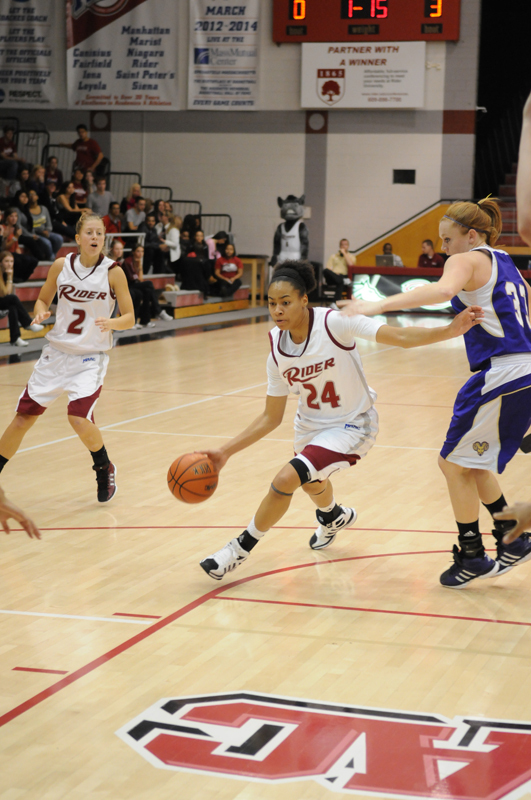 McKenzie posted a double-double in Rider’s exhibition defeat against West Chester last Sunday. The women’s basketball season opens this weekend as it hosts Lafayette tonight at 7 and Bucknell on Sunday at 4 p.m. The outlook is bright for the Broncs despite falling to Division II West Chester in an exhibition game after a tough battle in Alumni Gym last weekend. Sophomore MyNeshia McKenzie had a strong start in the exhibition, finishing with 13 points and 15 rebounds. Freshman Emily Fazzini also made her presence known on the court with 10 points against the Rams. However, it wasn’t enough to overcome West Chester, which walked away with a 65-63 win. After the loss, the Broncs are ready to begin the season to show how they have improved. Junior Carleigh Brown and her teammates want to make amends for their performance after finishing 5-25 last season. “We’ve been waiting for the chance to prove ourselves since our last game in the MAAC Tournament last season,” she said. Lafayette, which was 11-19 last season, will be a tough undertaking for the Broncs. In order for the Broncs to get the win, tough defense and aggressive offense will be two crucial elements. The Leopards have good shooters who pose a threat to the Broncs. However, forwards Homan and junior Caitlin Bopp appear to counter that, making an impressive combined total of 156 field goals last season. The Broncs squad consists of a healthy mix of new and returning players, which is an aspect that the team views as an advantage. “With more returning players, we have more experience and confidence on the floor,” Homan said. The Bucknell Bison come to Alumni Gym on Sunday. Bucknell was 11-17 last season with several seesaw battles. The Broncs have a new-found drive to win, especially within the senior class. Despite a loss to the Bison last season, the Broncs look stronger and wiser this coming year. The desire to win is very apparent, as are optimism and eagerness. “We are a lot older as a team this year and are ready to do whatever is necessary for our team to be on top when the final buzzer goes off,” Brown said. The Broncs are looking to test their ability to open the season well and are ready to try to start on a positive note. “We are ready for the challenge,” Homan said. Brown believes the Broncs can play well in games like they do in practice.